(Nanowerk News) Leica Microsystems and Digital Surf announced the signature of an agreement whereby Leica Map surface imaging and metrology software based upon Digital Surf's Mountains Technology® will be used with the Leica Application Suite (LAS) for Leica industrial microscopes. The new Leica Map software is used to visualize and quantify features of measured surfaces, characterize surface texture and geometry and generate visual surface metrology reports with full traceability. It is available on three levels with optional modules for advanced applications. Entry level Leica Map Start software is used in conjunction with LAS Montage. LAS Montage acquires a series of image planes at known spacing covering the in-focus region of a specimen with a Leica microscope. From this stack a depth map and an extended focus image are derived and analyzed by Leica Map. In Leica Map Start, surface topography can be viewed at any zoom level and any angle in real time. Color and intensity image overlays facilitate the location of surface features, including defects. Distances, angles, and step heights can be measured. Height and functional parameters are calculated in accordance with the latest ISO 25178 standard on areal surface texture. 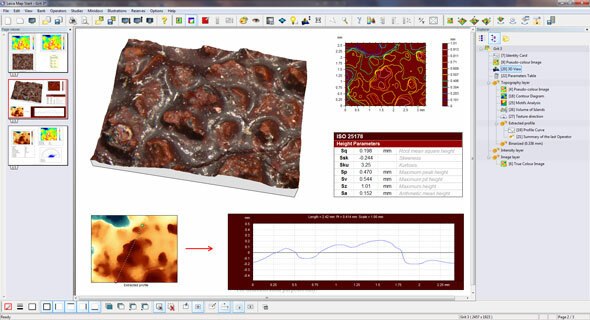 Optional modules can extend the capability to surface texture and contour analysis. Leica Map's desktop reporting environment makes it easy to visualize and analyze measurement data and to generate reports with full metrological traceability. Leica Map DCM 3D software is dedicated to the Leica dual core 3D microscope Leica DCM 3D, which combines confocal and interferometry technology for non-invasive, high speed, and high-resolution assessment of micro and nano structures. In addition to the standard features of Leica Map Start, Leica Map DCM 3D includes advanced ISO 16610 filtering techniques for separating surface roughness and waviness, basic functional analysis (bearing ratio, depth distribution, etc. ), and the ability to extract sub-surfaces (for example from mechanical and electronic components and MEMS) and analyze them independently. The Leica Map product range is completed by Leica Map Premium, a top of the line universal solution that is compatible with single-point tactile and optical profilometers and scanning probe microscopes, as well as with optical microscopes. "Leica Map is an important addition to the Leica Application Suite," stated Andreas Hedinger, Managing Director of Leica Microsystems' Industry Division. "It provides users of Leica microscopes with a comprehensive solution for surface imaging and metrology in accordance with the latest standards and methods." "Leica Map software is based upon the latest generation of Mountains Technology®, which was released in the second half of 2010," stated François Blateyron, Chief Operating Officer of Digital Surf. "It incorporates an enhanced desktop publishing environment, to speed up complex calculations and the processing of large measurement data sets." Leica Microsystems is a world leader in microscopes and scientific instruments. Founded as a family business in the nineteenth century, the company's history was marked by unparalleled innovation on its way to becoming a global enterprise. Its historically close cooperation with the scientific community is the key to Leica Microsystems' tradition of innovation, which draws on users' ideas and creates solutions tailored to their requirements. At the global level, Leica Microsystems is organized in four divisions, all of which are among the leaders in their respective fields: the Life Science Division, Industry Division, Biosystems Division and Medical Division. Leica Biosystems, an own operating company, offers histopathology laboratories the most extensive product range with appropriate products for each work step in histology and for a high level of productivity in the working processes of the entire laboratory. The company is represented in over 100 countries with 12 manufacturing facilities in 7 countries, sales and service organizations in 19 countries and an international network of dealers. The company is headquartered in Wetzlar, Germany. Digital Surf, founded in 1989, is a leading provider of imaging and analysis software for surface metrology instruments including confocal microscopes, optical interferometric microscopes, scanning probe microscopes and 2D/3D profilometers. Imaging and analysis software based on Digital Surf's Mountains® technology is integrated by leading instrument manufacturers and is used in thousands of laboratories and industrial facilities working in numerous sectors including aerospace, automotive, cosmetics, energy, MEMS, materials research, medical, metallurgy, nanostructures, optics, paper, PCB, plastics, polymers, printing, semiconductor, etc.